Ohio was approved as a state in 1803, however at the time Congress never passed a resolution to admit Ohio into the union, and it wasn’t until 1953 that the oversight was discovered and Ohio was retroactively admitted as the 17th state. 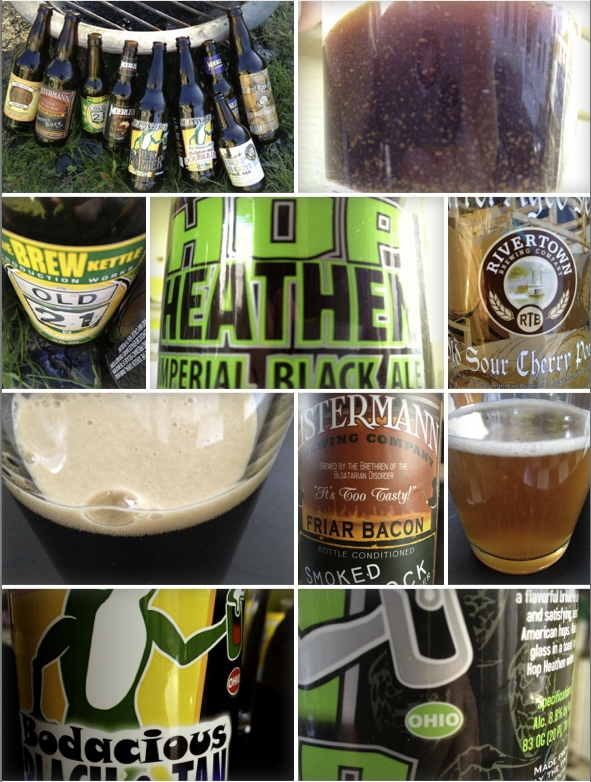 When I started on this project, my goal was (and still is) to try beer from a different state each week for 50 weeks. I knew it wouldn’t be an easy task, but I mentally bound myself to the week idea and specified Saturday as my end day for the week. So each week could, in theory kick off on a Sunday and run through until the following Saturday. In reality, most of the tastings occur on either the Friday or Saturday evenings at the end of the week. And I then try to get the post up on Sunday, time permitting. So when we were at the middle of last week and I had no idea if I would have beer for this week, I was starting to get nervous, and thinking the project goal was going to fail at Ohio. In New England, beer from Ohio is scarce. 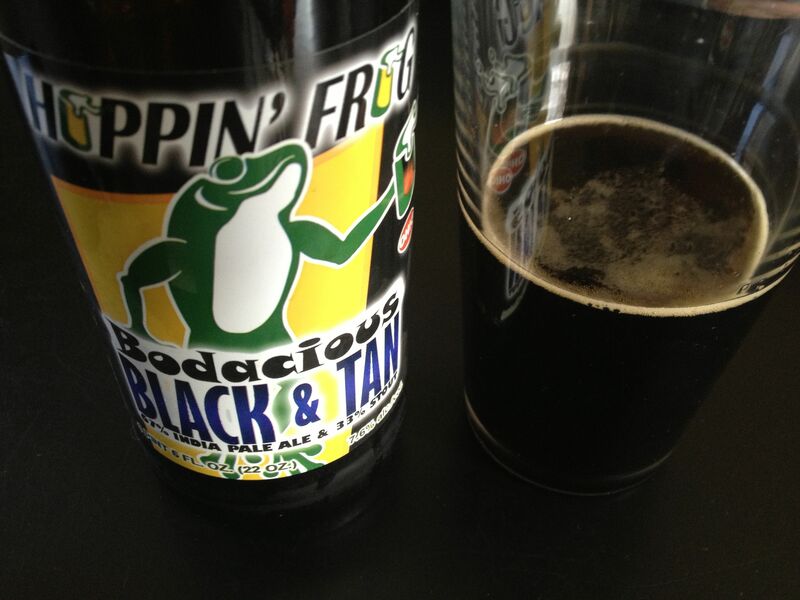 I have seen mention of some beer, mainly from Hoppin’ Frog Brewery available in a few places, but it wasn’t guaranteed. So I decided it was time to look at alternative means for this week. On the original purchase run back in December, my sister-in-law (let’s call her Heather) was doing the drive with me. As I was explaining the potential difficulties of Ohio, she mentioned that she had contacts that would help. And, Ohio being a border state, her contact could also take care of Indiana (two weeks away) as well. So, for this week we would be moving into the social aspect of the project. The streak was alive. I had two bottles of beer in hand, bought in my town from Ohio. That evening, the usual clan of tasters arrived at 5, and we set about sampling Hoppin’ Frog Bodacious Black and Tan as well as Hoppin’ Frog Hop Heathen. I have to admit I am puzzled by Black and Tan in a bottle. Sure, there are some good ones out there, but I always associated a Black and Tan with the experience. The two layers of beer in the glass, and as Joel put it “Having to get the green card Irish guy to pour it for you.” So we set about this beer biased out of the gate. The beer had a nice smell in the glass, tasted fine, but there was a weird after-taste. The reports were about equal across the group, with “For a Friday afternoon sippin’, this is fine.” But it was “Nothing special.” In the final pour from the bottle, there was plenty of sediment, as can been seen in the top right corner of the collage photo. 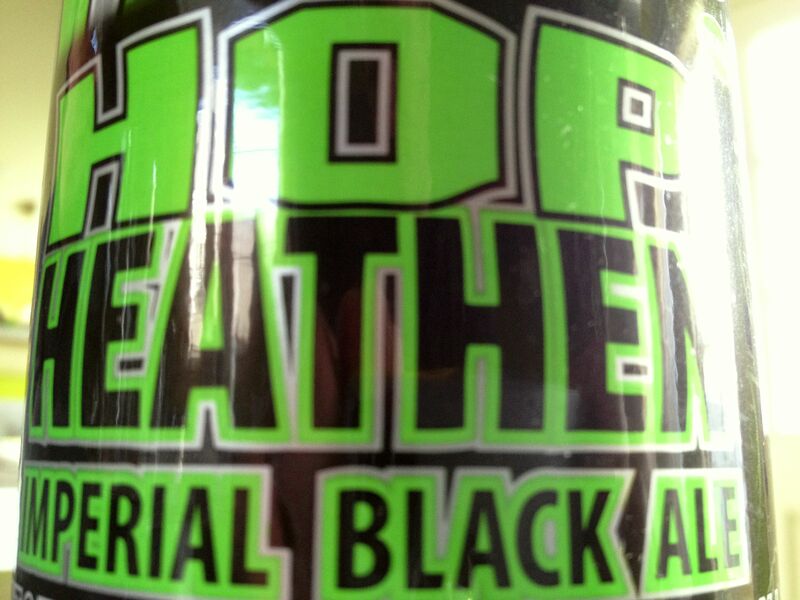 The next beer we moved on to was called Hop Heathen, an Imperial Black Ale. The bottle for this beer was imprinted with text describing the beer, including something about an uncivilized amount of hops. We have had our share of over hopped beer during this project, and this bottle did not join that unique class of beer, however I liked this beer. It has a nice, malty flavor. It wasn’t the best Black Ale in the world, but it was not bad at all. With no smell or taste of the hops, we ended with “The only thing uncivilized on this beer is the horrible label.” With two bottles from Ohio in the books, I felt relaxed that the goal lived for another week. A major goal in manufacturing is the reduction of product inventory. From this goal arrived the idea of Just in Time Inventory (JIT). Under the just in time inventory system, “shipments are made within rigidly enforced time windows.” A fact I left out earlier is that both Heather and Corey are engineers, and well versed in the JIT model. So, on the last day of the ‘project week’, I opened my door to a box from Ohio that contained, nine, yes nine different bottles of beer from Ohio (and a few from Indiana too). This arrival turned Saturday evening into a second tasting for Ohio, and our second largest covering for the year. So a big shout out to Corey for helping us maintain our goal for yet another week. A lot to cover, but I found people who were up for the task. 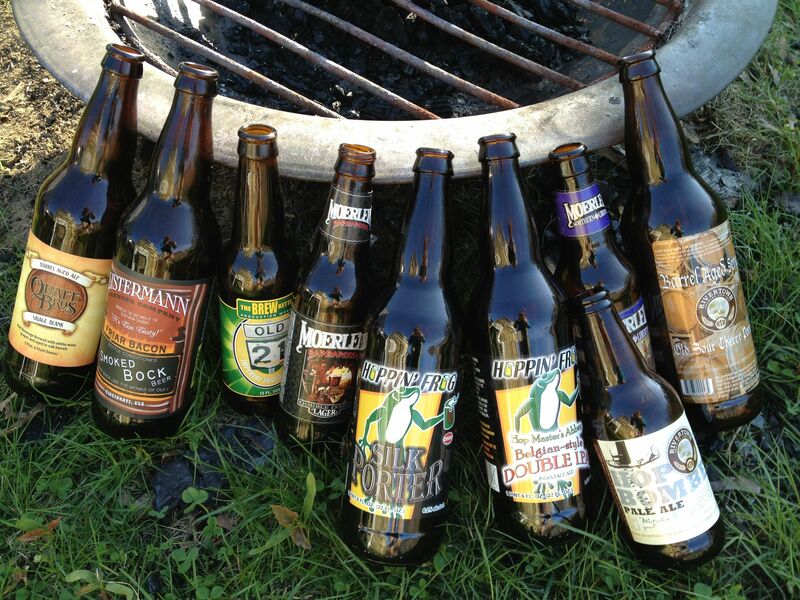 I started by rounding up the usual suspects for an initial tasting, then it would be concluded around a fire pit Saturday night with my auxiliary tasters. Going with out established axiom that “The best things so far have come in big brown bottles”, we set our sights in the big ones. A Belgian Golden Ale brewed with Sauvignon Blanc grape juice, aged in four different Bourbon barrels and blended together. This beer had a strong smell of grapes. And the taste was a unanimous dislike from everyone that tried it (5 people total). Wine has its time and place, as does beer. Let’s keep them separate. 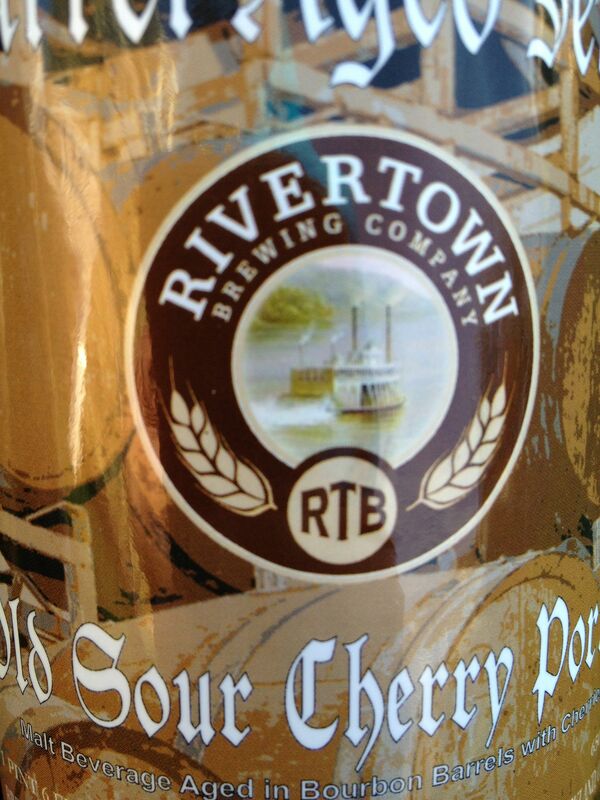 The next big, brown that we moved into was from Rivertown Brewery located in Lockland Ohio. Part of their Barrel Aged Series, the Old Sour Cherry Porter was released in the Spring of 2013. Listed as an Imperial porter aged in bourbon barrels with dark Michigan cherries and lactobacillus delbrueckii (a Belgian souring bacteria). I didn’t read the description for this beer until writing this post, but during the tasting, I referred to this beer as tasting like a lambic. The sour was definitely there, and the cherry taste was strong, but not discouraging. I enjoyed this beer, and everyone else that tasted it agreed. Not something you would want in large quantities, but for a single glass, this was nice. Next up was a beer with an interesting label. From Listermann Brewing Company in Cincinnati, we had a bottle of their specialty brew: Smoked Bock Beer. The label gave this beer some serious potential, but unfortunately the potential ended there. This beer smelled and tasted like liquid smoke. That is not a good quality in a beer. With quotes from the samplers like “What would you put a label on that.” it wasn’t well received across the group. However the selection from Corey turned a corner after that and we all enjoyed everything else. Partly because we moved into the IPA area, and most of the tasters are fans of a good IPA, but the Silk Porter from Hoppin’ Frog, with its chocolate aromas, was a great beer too. The Hop Master’s Abbey, a Double IPA from Hoppin’ Frog had a big citrus nose and taste. A very enjoyable beer. The Old 21 from Brew Kettle was wonderful, with its bouquet of pine, this beer, compared to the previous IPA, was an excellent example of the characteristics different types of hops, in this case the Simcoe, bring to a finished product. The Barbarossa Double Dark Larger from Christian Moerlein Brewing (techincally brewed in PA, but we let that slide), had an interesting carmel taste. It drew up conversation of early days of beer experimentation, when products like Becks Dark were considered extreme. Another beer from Christian Moerlein was the Northern Liberties IPA. This beer was fine, but not the best IPA of the evening. On its own, without having previously had the Hop Master’s Abbey or the Old 21, I would have really enjoyed this beer. We ended the sampling with another beer from Rivertown Brewery called Hop Bomber. At this point in the tasting, I was a bit over hopped from the three previous IPAs, so I mostly picked up a bitter taste. However I think I was mentally mislead by the name. I was expecting a strongly hopped beer akin to a Dogfish Head. But reviewing the brewers website, I can see that is not the intended case. An American pale ale named after the famous B-24 Liberator Bomber. This beer has a wonderful malt backbone from the use of dark english crystal malt and spicy fresh rye malt. It is dry hopped with two varieties of American hops for a crisp refreshing flavor. This is a beer would like to get my hands on again, with a fresh palate. After starting with a nervous feeling of missing my goal, Ohio proved to be an exciting week. I never expected such a wide variety and interesting beers to arrive on my doorstep. Once again, a huge thanks to Corey for the great beer selection for the week. Next week, back south for Louisiana.